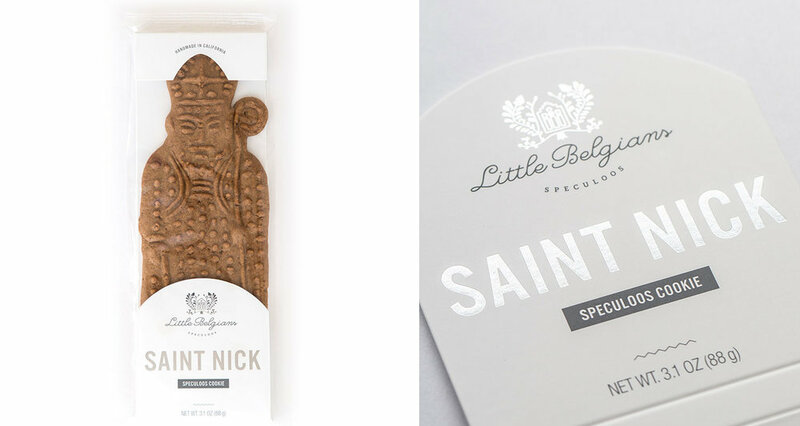 This Berkeley cookie company has created an oversized holiday treat in the shape of the Belgian version of Santa – St. Nick. To show rather than explain to US customers what this giant speculoos Christmas cookie is all about, we developed custom packaging in the form or a card that wraps around the cookie and gets sealed in foil, leaving a large transparent area in the front. Working with only gray and silver, we kept the design minimal, yet festive. When Little Belgians developed a S'mores Kit that combines their ridiculously delicious speculoos cookies with Tcho chocolate and marshmallows, Rena B Design created the cookie design as well as the tray & sleeve packaging with custom illustrations. The signal color was chosen to stand out on the shelf, and work for both summer and wintertime fires.